The fabled city of Memphis has been essential to American music--home of the blues, the birthplace of rock and roll, a soul music capital. We know the greatest hits, but celebrated author Robert Gordon takes us to the people and places history has yet to record. A Memphis native, he whiles away time in a crumbling duplex with blues legend Furry Lewis, stays up late with barrelhouse piano player Mose Vinson, and sips homemade whiskey at Junior Kimbrough's churning house parties. A passionate listener, he hears modern times deep in the grooves of old records by Lead Belly and Robert Johnson. 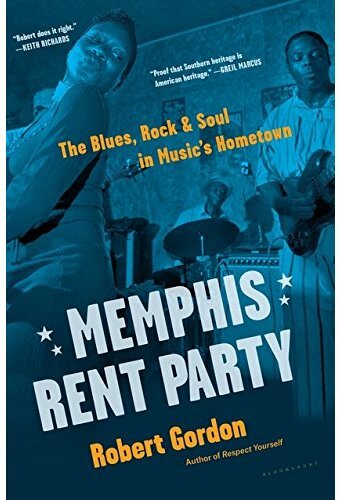 The interconnected profiles and stories in Memphis Rent Party convey more than a region. Like mint seeping into bourbon, Gordon gets into the wider world. He beholds the beauty of mistakes with producer Jim Dickinson (Replacements, Rolling Stones), charts the stars with Alex Chilton (Box Tops, Big Star), and mulls the tragedy of Jeff Buckley's fatal swim. Gordon's Memphis inspires Cat Power, attracts Townes Van Zandt, and finds James Carr always singing at the dark end of the street. A rent party is when friends come together to hear music, dance, and help a pal through hard times; it's a celebration in the face of looming tragedy, an optimism when the wolf is at the door. Robert Gordon finds mystery in the mundane, inspiration in the bleakness, and revels in the individualism that connects these diverse encounters.